Rooster is one of the most intimate animals for human beings. SSTM staged the Special Exhibition for the Year of the Rooster to mark the Chinese lunar Dingyou Year at the Ball Hall on the first floor of the museum from January 20 to May 1, 2017. The exhibition revealed the secrets of Galliformes by asking and answering 17 interesting questions. 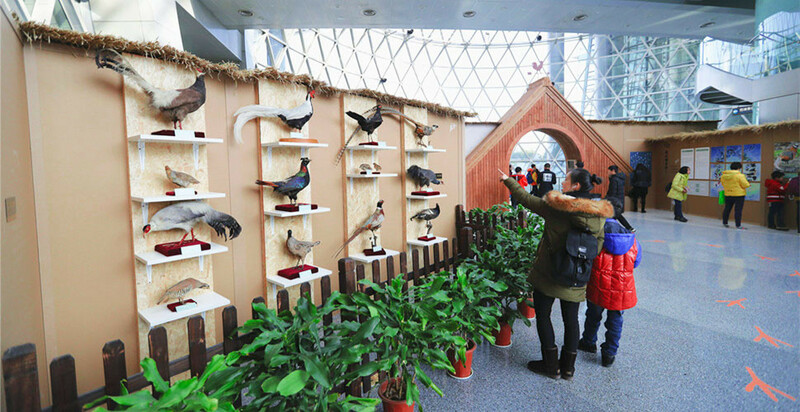 The Special Exhibition for the Year of the Rooster also prepared a surprise for visitors: a design invitation exhibition with the theme of “Heralding the break of day”. Designers and children from the Chinese mainland, Hong Kong, Macau and Taiwan joined hands to make 16 artistic design works. Based on these works, the museum developed a series of unique derivatives. The exhibition organizer also prepared a series of educational activities for children, including debates, lectures, online and offline interaction, DIY wooden transmission miniatures, making electronic badges, as well as story saloon.